A starting point for most recent educational policy and pedagogic practice concerning the teaching of English in Japan has been the language’s status as the pre-eminent channel for international communication throughout the late twentieth and early twenty-first centuries. The general context that began with the Nakasone policies of the 1980s has continued as an underpinning ideology for much of the educational agenda towards the language ever since. A great deal has changed in geopolitics since the 1980s, however, and this change has been especially acute in the last few years. 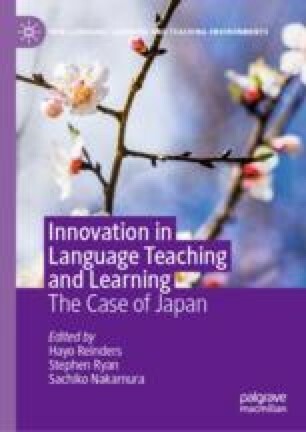 This chapter explores the changing context of English in Japan as the background against which innovative and engaging pedagogy for the language now needs to exist. Carrigan, L. (2018, April 20). A new challenge: Changes to elementary school English education in Japan for 2020. Japan Today. Retrieved from https://japantoday.com/category/features/lifestyle/a-new-challenge-changes-to-elementary-school-english-education-in-japan-for-2020. Accessed June 12, 2018. CJGTC [Prime Minister’s Commission on Japan’s Goals in the Twenty-First Century]. (2000). The frontier within: Individual empowerment and better governance in the new millennium. Retrieved from https://www.kantei.go.jp/jp/21century/report/pdfs/index.html. Accessed June 17, 2018. Council of Europe. (2018). Common European Framework of Reference for Languages: The CEFR levels. Retrieved from https://www.coe.int/en/web/common-european-framework-reference-languages/level-descriptions. Accessed June 12, 2018. Goldmacher, S. (2016, September 23). Trump’s English-only campaign. Politico. Retrieved from http://www.politico.com/story/2016/09/donald-trumps-english-only-campaign-228559. Accessed May 21, 2018. Goulard, H. (2016, June 27). English will not be an official EU language after Brexit, says senior MEP. Politico. Retrieved from www.politico.eu/article/english-will-not-be-an-official-eu-language-after-brexit-senior-mep/. Accessed May 21, 2018. Honda makes English official language for global talks. (2013, November 22). Japan Times. Retrieved from www.japantimes.co.jp/news/2013/11/22/business/corporate-business/honda-makes-english-official-language-for-global-talks/#.Vd2hyJOCOrV. Accessed May 21, 2018. Hongo, J. (2013, March 25). Abe wants TOEFL to be key exam. Japan Times. Available at www.japantimes.co.jp/news/2013/03/25/national/abe-wants-toefl-to-be-key-exam/#.Vd2iUMR4WrU. Accessed May 21, 2018. Ito, H., & Chan, S.-J. (2017). Rethinking active learning in the context of Japanese higher education. Cogent Education, 4(1). Retrieved from https://www.tandfonline.com/doi/full/10.1080/2331186X.2017.1298187. Accessed June 12, 2018. Lopez, M. H., & Gonzalez-Barrera, A. (2013). What is the future of Spanish in the United States? Pew Research Center. Retrieved from http://www.pewresearch.org/fact-tank/2013/09/05/what-is-the-future-of-spanish-in-the-united-states/. Accessed May 21, 2018. Macron says too much English spoken in pre-Brexit Brussels. (2018, March 21). Japan Times. Retrieved from www.japantimes.co.jp/news/2018/03/21/world/social-issues-world/macron-says-much-english-spoken-pre-brexit-brussels. Accessed May 21, 2018. Mainichi. (2016, August 2). Proposed new English curriculum feared to add heavier toll on teachers. Retrieved from https://mainichi.jp/english/articles/20160802/p2a/00m/0na/021000c. Accessed June 12, 2018. Matsutani, M. (2012, June 30). Rakuten’s English drive ready to take full effect, chief says. Japan Times. Retrieved from www.japantimes.co.jp/news/2012/06/30/national/rakutens-english-drive-ready-to-take-full-effect-chief-says/#.Vd2hQ5OCOrW. Accessed May 21, 2018. Native speakers in demand as Japanese schools step up English lessons. (2018, March 16). Kyodo News. Retrieved from https://english.kyodonews.net/news/2018/03/486b6a277aad-feature-native-speakers-in-demand-as-japanese-schools-step-up-english-lessons.html. Accessed June 12, 2018. Rankin, J. (2017, May 5). Brexit: English is losing its importance in Europe, says Juncker. The Guardian. Retrieved from www.theguardian.com/politics/2017/may/05/brexit-english-is-losing-its-importance-in-europe-says-juncker. Accessed May 21, 2018. Sharman, J. (2017, January 24). Donald Trump’s administration takes down Spanish-language White House website. The Independent, 24. Retrieved from http://www.independent.co.uk/news/world/americas/donald-trump-administration-takes-down-white-house-spanish-language-website-civil-rights-history-a7543121.html. Accessed May 21, 2018. Tsuboya-Newell, I. (2017, October 29). Why do Japanese have trouble learning English? Japan Times. Retrieved from https://www.japantimes.co.jp/opinion/2017/10/29/commentary/japan-commentary/japanese-trouble-learning-english/#.WyKB1ObTWhA. Accessed June 12, 2018.